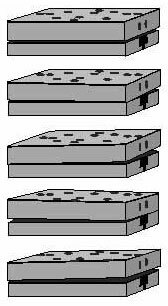 Multi-cavity molds often produce inconsistent parts which are difficult to weld without shimming or jack screws. The Toman Hydraulic and Mechanical Squaring Bases assure automatic, equal welding pressure on irregularly shaped, circular or multi-cavity parts. They are also excellent at sealing film or very thin materials in thermal applications. 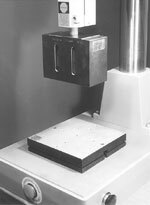 The Standard Size base is ideal for ultrasonic welding or larger thermal staked parts while the Dial Size works well on a dial/rotary table. 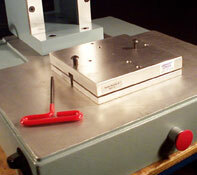 Easily mounts to most ultrasonic welder bases and all Toman thermal units. The base tilts in all directions to assure even pressure applied to the part by the ultrasonic welding horn or thermal tips. Easily mounts to most ultrasonic welder bases. The base tilts in all direction to assure even pressure applied to the part by the ultrasonic welding horn.